The bigger story is the software. In addition to the integrated Google Play for Education system and NFC for easy setup in the classroom, Samsung's press release says that this Galaxy Tab will be loaded with Android 4.4. We were expecting to see the Galaxy Tab 3 line get KitKat anyway, but the press release also says that this tablet will be available starting in April. Here's hoping that Samsung sees fit to send the update out to regular consumers before then. 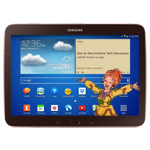 The Galaxy Tab education model will only be made available to schools and other large volume buyers via Samsung's distribution partners. Pricing hasn't been revealed, but that will probably be contingent upon bulk ordering and other large-scale factors. The company is hoping to get plenty of tablets to schools before the start of the 2014-2015 school year. 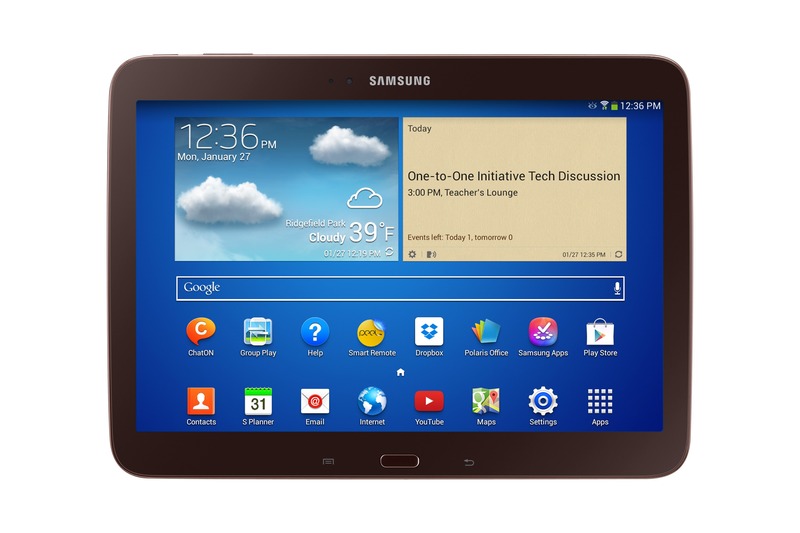 ORLANDO, Fla.--(BUSINESS WIRE)--Samsung Electronics America, Inc. today at FETC 2014 announced plans to launch a new Galaxy Tab exclusively developed for education, which will be available for K-12 school deployments for the 2014-2015 academic year. Launching as part of the Google Play for Education program, the classroom-ready, 10.1-inch tablet will offer simple set up and device management, access to curated educational content, and other features to support dynamic, digital teaching and learning. Samsung’s education-specific Galaxy Tab is designed for integration with Google Play for Education, Google's content store for K-12 schools. Google Play for Education gives educators access to a wide selection of teacher-approved apps, books, and videos, helping them deliver more engaging and personalized learning to each student. Teachers can search for content by grade, subject and standard (including Common Core), make purchases using a pre-loaded school PO rather than a credit card, and deliver content to students' tablets in a matter of seconds. With a 10.1-inch WXGA display, the new Galaxy Tab for Education provides students an exceptional viewing experience and the 16:10 aspect ratio is ideal for viewing educational content. It will feature the latest version of Android (version 4.4 or Kit Kat), WiFi 802.11 a/b/g/n support for better connectivity, and rear- and front-facing cameras to make capturing images and web chats easy. The new Galaxy Tab will also include Near Field Communications (NFC) technology, so administrators can quickly and easily set up a classroom of devices with a few taps. Google also provides a web-based management console that will allow schools to easily manage and configure their entire fleet of devices. Samsung’s new education tablet is set to expand its lineup of Android-powered Galaxy devices and complements the company’s broad portfolio of technology solutions for K-12 education. Available from April, the new Galaxy Tab for education will be sold through Samsung distribution and channel partners.